Gentleman Jim Stacey is a Redguard thief and Master Thief of the Thieves Guild on Vvardenfell. 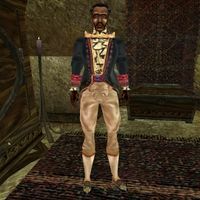 He can be found along with his close confidante Crazy-Legs Arantamo in the back room of Simine Fralinie's bookshop, in the east Canalworks of Vivec Foreign Quarter. He works tirelessly to prevent the Guild from being destroyed by the joint efforts of the Camonna Tong and their pawns, the Fighters Guild. He only gives missions to those ranked Captain and above. However, to those who have proved themselves a little, he is willing to entrust sacred Bal Molagmer quests, aimed at fighting injustice across Vvardenfell. There is a rumor about him being pretty mad about a few missing artifacts. He is wearing an extravagant shirt, belt, pants and shoes. He wields a daedric shortsword. Like all Redguards, he has a natural resistance to poison and disease, and can boost his health, strength, agility and endurance for a short period of time; otherwise he knows no spells. "I may have jobs for you, but you might be interested in something a bit different: the Bal Molagmer." "You were to return the Hlervu Locket, %PCRank." "The Bal Molagmer must end Yngling Half-Troll's corruption. Have you found the ledger?" "Did you recover the forged land deed, %PCRank?" "Enamor must be returned to its rightful owner. Is this done?" "You were sent to steal Brallion's Ring and deliver it to Ilmeni Dren. Tell me your status." "Did you deliver those history books in the name of the Bal Molagmer?" "Were you able to bring the Dwemer Goblet to one more worthy of its value?" "Were you able to locate Nads Tharen and his key?" "I sent you to speak to Percius Mercius and see if he was willing to help us fight." "Were you able to retrieve the Bitter Cup and bring it to Eydis Fire-Eye?" "What is the situation with Hrundi? Will he join our cause? Have you found Hrundi's woman?" "Were you able to get rid of the brothers Ienith? I know they are powerful does, but they are a great strength of our enemy." "Does Sjoring Hard-Heart still live?" Advancement: "If you do all the jobs I have for you, I will grant you the rank of %NextPCRank." [Right Bal Molagmer Glove has been added to your inventory. Left Bal Molagmer Glove has been added to your inventory.] "There is a legend about "Stone Fire Men" who brought the light of justice to the land. Though the Bal Molagmer were thieves, they stole only from the unjust and gave to those in need. They vanished early in the Third Era, and have not been seen since. I believe it is time for the Bal Molagmer to return. Here--these gloves were used by the Bal Molagmer to ca try their burning stones from the Red Mountain. When you are ready to rekindle the fires of the Bal Molagmer, wear the gloves and speak to me again." "If you don't wear the gloves of the Bal Molagmer, how can you show these Dunmer that thieves are not wholly evil?" "I've chosen something simple for the first mission of the reformed Bal Molagmer. I need you to return the Hlervu Locket." "You did well with the Hlervu Locket. For the next appearance of the Bal Molagmer, I want proof of Yngling Half-Troll's corruption." "A poor widow needs our help. A Hlaalu Councilor is trying to steal her land with a forged land deed." "One of our brothers stole from the wrong man. I need someone to return the blade Enamor." "Unfortunately, you are known to have killed Salyn Sarethi. No Dunmer would follow one such as you. I will have to find someone else to carry on the work of the Bal Molagmer." "Unlike most Dunmer, the Bal Molagmer opposed slavery. I want you to steal Brallion's ring." "Everyone in Caldera is corrupt. Rather than act directly, I want you to steal Odral Helvi's history books." "There is a rumor that you murdered Vala Catraso. I do not know if it is true, but I cannot let you pretend to be a Bal Molagmer with these rumors." "The Ordinators have been harassing Danso Indules, an honest but poor priest. I want you to steal a Dwemer goblet and donate it to her cause." "I don't know what else the Bal Molagmer should do." "Now you know as well as I do what the Bal Molagmer should do. I will trust your judgement." "Percius Mercius told us that Eydis Fire-Eye worships Clavicus Vile. Perhaps she would betray Sjoring Hard-Heart for the Bitter Cup, an artifact sacred to Clavicus Vile. The Bitter Cup was lost in the ruins of Ald Redaynia, which is on an island north of the Urshilaku Camp." "Eydis Fire-Eye is dead? That is a problem. Well, she can't hurt us now, but neither can she help us. We'll have to move on to other jobs." "There's nothing more we can do about this." "Where's the Bitter Cup? You didn't succumb to its power, did you?" No way. Not me. [Disposition -2.] "Good. Now please go get it. Time is of the essence." Yeah. I blew it. [Disposition -5.] "Fool! You used it?! Well, I can't say as I blame you. Scratch one bribery attempt, though. But things might still work to our advantage." "Let's not being that one up again." [Disposition +10. Grandmaster's Pick.] "So Eydis took the Bitter Cup. Good. She's likely to betray us, too, but only if she thinks we think she won't. Anyway, I found some good lockpicks the other day and thought you might could find a use for them." "Eydis Fire-Eye has the Bitter Cup now." "You'll find him in Sadrith Mora, in the Great Market." "I have heard of his death." "Brallion has the ring, naturally. He's a slave trader in Sadrith Mora's Great Market. Steal the ring and then deliver it to Ilmeni Dren, a secret abolitionist and the daughter of Duke Vedam Dren." "I wanted you to deliver a slaver's ring to Ilmeni Dren, but you tell me she's dead. I don't like the sound of that, %PCName. Lets [sic] forget about this completely." "Let us speak of this no more." [Disposition +10.] "So you delivered the ring. Good. I hope Ilmeni Dren puts it to good use." "You already delivered the ring." "Yngling Half-Troll is corrupt. Many know this, but no one dares act. The Bal Molagmer bring justice to those who think themselves above justice. Go to Yngling Manor in Vivec. There you will find a ledger with proof of his corruption. Bring that ledger to me." "I still need the ledger if we are to prove his corruption." "You say he has already destroyed the ledger? How very odd. He must have suspected we were onto him. No matter. I have other jobs for you." "We'll never be able to prove his corruption with that ledger destroyed." "Yes, this is the ledger I was looking for. Give it to me now so that I can publish the truth about Yngling Half-Troll." Give Stacey the ledger. [Disposition +10. Yngling's Ledger has been removed from your inventory.] "I knew he was misusing some of the money, but it looks like he took almost all of it. Why, Yngling Half-Troll is a bigger thief than any of us!" "You brought me proof of Yngling Half-Troll's corruption." Keep the ledger. "If you don't give me that ledger, I can't show everyone the truth about Yngling Half-Troll." Dren Plantation: "It's not hard to find, but it doesn't have to be. It's very well guarded, and they don't take kindly to trespassers. I'll mark the location on your map." "There is a Dwemer goblet in Berel Sala's office in the Hall of Justice. Steal this goblet and donate it to Danso Indules, who is usually outside near the High Fane." "You shouldn't have told her where you stole it from, but it can't be helped now." [Disposition +10.] "Good. Danso Indules can sell that goblet and do more good than Berel Sala and the Ordinators ever will." "You already gave the goblet to Danso Indules." [Note to Salyn Sarethi has been added to your inventory. Enamor has been added to your inventory.] "This is Enamor. A Guild member stole it from Salyn Sarethi, a noble and generous Buoyant Armiger. The blade was a gift from Vivec himself. We do not want the Thieves Guild to be blamed for this kind of theft. Take this blade and this note. Put them in Salyn Sarethi's chest in the Tower of Dusk in Ghostgate." "Just take the blade Enamor and the note I gave you. Put both of them in Salyn Sarethi's chest in the Tower of Dusk at Ghostgate." [Disposition +10.] "So, the blade and note are in Salyn's chest? Good work. I hope you didn't have too much trouble." "Saryn Sarethi's blade has been returned to him." "The Hlaalu Councilor Velabda Omani wants Indrele Rathryon's land. Velabda Omani forged a land deed and placed it in the Library of Vivec. Without our help, Velabda Omani's bribes will prevent justice, and allow the forged deed to stand. Go to the Library of Vivec, find the deed, and deliver it to Indrele Rathryon in the name of the Bal Molagmer." "You have the land deed? Take it to Indrele Rathryon in Seyda Neen." [Disposition +10.] "I heard you gave the land deed to Indrele Rathryon. Maybe Velanda Omani will leave her alone now." "Indrele Rathryon has the deed now, and the Temple courts have been stalled." Gentleman Jim Stacey: "That's me. What is it?" "Percius Mercius is the Steward of the Guild of Fighters in Ald'ruhn. He used to be the Master of the Fighters Guild before the Camonna Tong got involved. I believe he will help us fight the Camonna Tong. Go speak with him and listen to what he has to say. Report back to me with any information." [Disposition +10. 500 Gold has been added to your inventory.] "Well it sounds like Percius came through after all. I can already think of a way to make use of this [sic] In the meantime, here's some clink for your pockets." "You already asked Percius Mercius to help us fight. I thank you." "Odral Helvi in Caldera has all four volumes of "A Brief History of the Empire." They are personal treasures of his, bound with gold and delicately printed. Family heirlooms. I want you to steal all four of these books and deliver them to Vala Catraso at the reading school at the Guild of Mages in Ald'ruhn. The school always accepts books as donations, but I want you to donate Odral Helvi's books in the name of the Bal Molagmer. You'll find Helvi and the books in the Governor's Hall in Caldera." [Disposition +10.] "Good work, %PCName." "I know the school could use more, but you've done your job, %PCName." "You aren't wearing the gloves, %PCRank." "Braynas Hlervu is a poor, retired egg miner. He gave his family's treasured locket to the taxmen this year. The locket is now being held in Venim Manor with the rest of the taxes. Wear the gloves I gave you and pay a visit to Venim Manor in Ald'ruhn. Find the Hlervu Locket and return it to Braynas Hlervu in the name of the Bal Molagmer." "So is that the locket? Take it to Braynas Hlervu in Ald'ruhn." "You say Braynas Hlervu is dead? That's terrible to hear. I'm sure you had nothing to do with that. Well, we'll have to move on, then. There are other ways the Bal Molagmer may help." [Disposition +10.] Good. Justice has been done. And if you kept a little something for yourself, I can certainly understand. I know something else the reformed Bal Molagmer might do if you're interested." "The Hlervu Locket has been returned." "Like Percius Mercius said, Hrundi has a Dunmer lover. If you can find out who she is, you can pressure Hrundi to join our cause. You can find Hrundi in the Sadrith Mora Fighters Guild. I'm sure you can find out something by asking around town." "Did you talk him into joining? Good. We're making progress, %PCName." "Hrundi agreed to join our cause." "Navil and Ranes Ienith can be found on the Dren Plantation. The Thieves Guild won't be safe from the Camonna Tong until their best enforcers are dead. Kill them and report back to me." [Disposition +10. Ring of Shadow Form has been added to your inventory.] "You've already killed Navil and Ranes Ienith? Good work, %PCName. Their deaths, along with the inproved defenses at our Guild halls, will keep the Camonna Tong off our backs, but the Fighters Guild is still a problem. Oh, and I found a ring you might like." [Disposition +10. Ring of Shadow Form has been added to your inventory.] "So Navil and Ranes Ienith are dead? Good work, %PCName. Their deaths, along with the inproved defenses at our Guild halls, will keep the Camonna Tong off our backs, but the Fighters Guild is still a problem. Oh, and I found a ring you might like." "You killed Navil and Ranes Ienith." "Ilmeni Dren lives here in Vivec in the St. Delyn Canalworks South-One. Be courteous with her, %PCName. The last thing we need right now is trouble with the Duke." "I have heard of her death. It is a sad thing." "Maybe she can use the money from the ring you brought her to help end slavery." Indrele Rathryon: "She is a poor widow who lives in Seyda Neen. Her husband, a Legionnaire, was killed by Camonna Tong thugs. She is a Dunmer, but she grew up in Cyrodiil and belongs to the Imperial Cult, so the Tribunal Temple will not give her charity." "A fellow thief and member of the Guild has gone missing. Would you track down Nads Tharen for me?" "The Fighters Guild is betraying the Empire for Camonna Tong gold. Percius Mercius, the old guildmaster in Ald'ruhn, might be willing to help us fight." "Based on what Percius Mercius told you, I think we can win over Eydis Fire-Eye if we can find the Bitter Cup." "Based on what we know, Hrundi might join our cause and betray his leaders in the Fighters Guild. If that doesn't work, we could put pressure on Hrundi's woman." "The Camonna Tong's best enforcers are Navil and Ranes Ienith." "You've made progress getting the Camonna Tong off our backs, but we can't rest until Sjoring Hard-Heart is dead." "Actually, this is the final job I'll give you. Take care of the Guild. You've done great things, %PCName. With you here, I think it's safe for me to take a little vacation. Maybe go back to Hammerfell, see the old family. Until I get back, I'm leaving the Guild in your capable hands." "Talk to Hrundi. If you can convince him to join our cause, you won't have to track down Hrundi's woman." "I understand Hrundi has been killed. Unfortunately, we won't be able to use him in our plans. There are still other jobs for you to take care of." "There's no point in speaking about this anymore." [Disposition +10.] "Did you talk him into joining? Good. We're making progress, %PCName." Library of Vivec: "You'll be able to access the Library through the Hall of Wisdom, which is accessible from the St. Olms' canton." "He used to hang out at the Elven Nations Cornerclub here in Vivec's Hlaalu Compound. He was supposed deliver [sic] a key to me. Find out what happened to him. If he's dead, as I fear, in his key and bring it to me." "So you found Nads Tharen and got the key." OR "So you avenged Nads Tharen and got the key." Give him the key [Disposition +10. Nads Tharen's Key has been removed from your inventory. 500 Gold has been added to your inventory.] "Yes, this is the right key. This buys us some time in our way with Camonna Tong. Keep an eye on Arvama Rathri. I believe she may be working for the Camonna Tong herself. And here's a little something for you." OR [Disposition +15. Nads Tharen's Key has been removed from your inventory. 1000 Gold has been added to your inventory.] "Yes, this is the right key. This buys us some time in our war with the Camonna Tong. I'm glad you killed Arvana Rathri. She was probably working for the Camonna Tong. Here's a little something for you." "I wish Nads Tharen hadn't died getting us this key. Everyone hopes never to see a fellow thief dead, but it happens." Keep the key "I'm not sure you understand who's in charge here." "We'll get back to him another time. For now, concentrate on your tasks at hand." [Disposition +15. The Skeleton Key has been added to your inventory.] "You already killed Sjoring, too, %PCName? Well, then. I guess that's settled. Sjoring Hard-Heart won't trouble our Guild again. Since you've saved the Thieves Guild here in Vvardenfell, I think you deserve this. It's the Skeleton Key--the most perfect tool ever created for lockpicking. I found when [sic] I lived in Hammerfell. Use it wisely. Now, I have new jobs for you to do." [Disposition +15. The Skeleton Key has been added to your inventory.] "You already killed Sjoring, too, %PCName? What ? You're the new Master of the Fighters Guild, too? Oh, what luck! Since you've saved the Thieves Guild here in Vvardenfell, I think you deserve this. It's the Skeleton Key--the most perfect tool ever created for lockpicking. I found when [sic] I lived in Hammerfell. Use it wisely. Now, I have new jobs for you to do." "He's the head of the Fighters Guild here in Vvardenfell. We've tried bribes, blackmail, and even diplomacy. Sjoring has some personal stake in this. I don't know what, but even without the Camonna Tong's backing, he's already planning an attack on all our Guild halls. Go to the Fighters Guild here in Vivec. Kill Sjoring Hard-Heart and report back to me." [Disposition +15. The Skeleton Key has been added to your inventory.] "So Sjoring Hard-Heart. Whatever his personal vendetta, he won't trouble our Guild again. The remaining leaders of the Fighters Guild are more sympathetic to us. Since you've saved the Thieves Guild here in Vvardenfell, I think you deserve this. It's the Skeleton Key--the most perfect tool ever created for lockpicking. I found it when I lived in Hammerfell. Use it wisely. Now, I have new jobs for you to do." "Sjoring Hard-Heart is dead. His vendetta is over." Urshilaku camp: "The Ashlander Urshilaku tribe has a permanent settlement at Urshilaku camp on the northern coast of Vvardenfell, north of Maar Gan village. Ald Redaynia is north of there. Here, let me mark it on your map." Vedam Dren: "He's not bad. He keeps the bad crime in line, but doesn't give us nearly as much trouble as he could. I think he knows we're all that's keeping the Camonna Tong in check." Venim Manor: "Look in Ald'ruhn, in the Manor District. Locals can tell you more." If you kill Jim, you'll find The Skeleton Key on his corpse. However, he is scripted not to have it on him when alive, so you won't be able to pickpocket it from him. Gentleman Jim Stacey also appears as a card in the Legends card expansion, the Houses of Morrowind.